Chai pendant is made of polished solid sterling silver. Open back. Weight: 3.25 grams. This item is the size of a penny. It measures 3/4in inch tall by 3/4 inch wide without the bail. 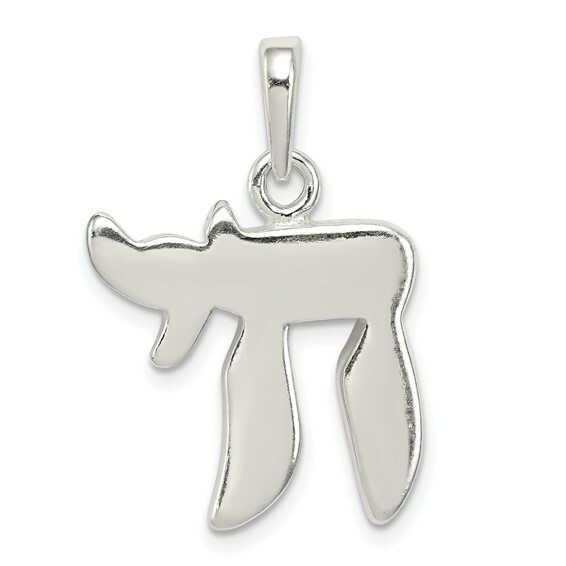 This charm fits on to to a chain up to 4mm wide. Popular to Jewish tradition, chai is a symbol of well-being and best wishes. Chain not included. Made in India. There are two alphabet letters.The first is the "hey", which is bigger and looks like a N in English alphabet, followed by the smaller "yud",which looks likes a comma but is higher placed.Whoever designed does not know the Hebrew alphabet which goes right to left unlike English which is read read and written right to left.